Looking to buy a roller cam pin for my Sig 516. Anybody know who has one in stock? POF is out of them. I think that BCM used to carry them. I'm not sure if they still do or not. I have a couple and they seem to work. I just ordered one from Rainier Arms. Received it today! FYI... If you look closely at the inside of your receiver on your SIG516 you will see there is a very slight angled cut where there would usually be cam pin wear. SIG engineers designed this to minimize cam pin gouging. FYI... If you look closely at the inside of your receiver on your SIG516 you will see there is a very slight angled cut where there would usually be cam pin wear. 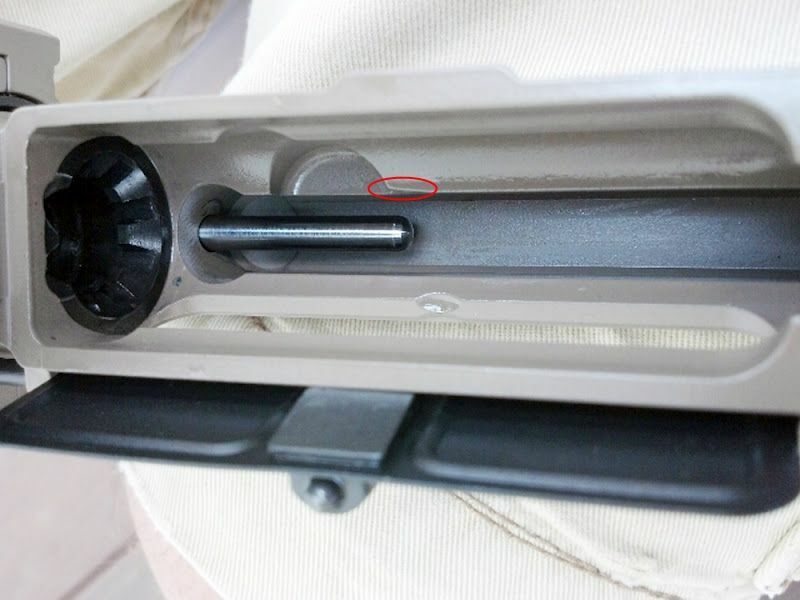 SIG engineers designed this to minimize cam pin gouging in order to avoid the incessant customer service calls from consumers more concerned about "fit and finish" about normal functional wear of the operating system that stops once adequately "worn in" and does not have any effect on the functioning of the weapon. That being said - increased cam pin wear is a side-effect of external piston driven operation in the AR - a system designed with an internal piston which initiates the unlocking cycle. Mi DI gun has the same wear as my two piston guns. The roller cam I have in one of them may slightly redice this but not so much that I am going to buy another one for the rifle that doesn't have one..
To clarify - I am talking about cam pin stress, rather than visible wear. Not that it makes a huge difference, I wouldn't be terribly concerned about either - but part of the function of the DI system is to work as an internal piston, while a piston system like we're talking about here simply uses rearward force on the carrier. Again - is this practical or not? Who knows, but there is more stress, and therefore "wear" (as in "wear and tear") on a piston cam pin. Visible wear in the upper receiver may be identical, and identically irrelevant. That's been my experience with the POF roller cam pin as well. It looks neat but I don't think it really does anything with regard to fuction or longevity. Both of my newest version 6940 & 6940P have a set screw (cam pin protector) holding a harden steel insert to prevent cam pin wear! I've looked at one of these for my Colt gas piston AR but have been concerned with what happens if or when that things comes apart under harsh conditions. I'd hate for it to cause a catastrophic failure. Someone please set me straight if my logic is way off. Both of my newest version 6940 & 6940P have a set screw holding a harden steel insert to prevent that. Our American Soldiers are so much more that just fighting men and women. They are a willing sacrifice on the alter of Freedom! For that, we are eternally grateful. Any chance of a pic of the insert? Maybe through the ejection port? Yes sir, Here is the best photo I could get with my iPhone. "I believe" it was put there to prevent ANY normal wear in both DI & piston systems. That is why my normal DI LE6940 has the same (Cam Pin Protector). This is my opinion & I wish somebody with colt experience would elaborate so I would not have to speculate. I guess nobody has seen this new design or there are NO colt APC experts on AR15.COM. Wow! Looks like Colt REALLY went out of their way to prevent normal cam pin wear. Strange. Well people asked and colt answered!! One piece BCG, Rear skids for anti-tilt & cam pin protector. They have addressed EVERY issue out there. What more would you expect colt to do?